Be it Ubuntu or any other platform, one thing I learned over the years is the fact that people like to download their favorite YouTube videos and would want to keep a local copy of it no matter how hard it is. Luckily, there are plenty of tools to do this in Ubuntu without any hassles. Here, we'll explore 5 of the most capable YouTube video downloading tools for Ubuntu. 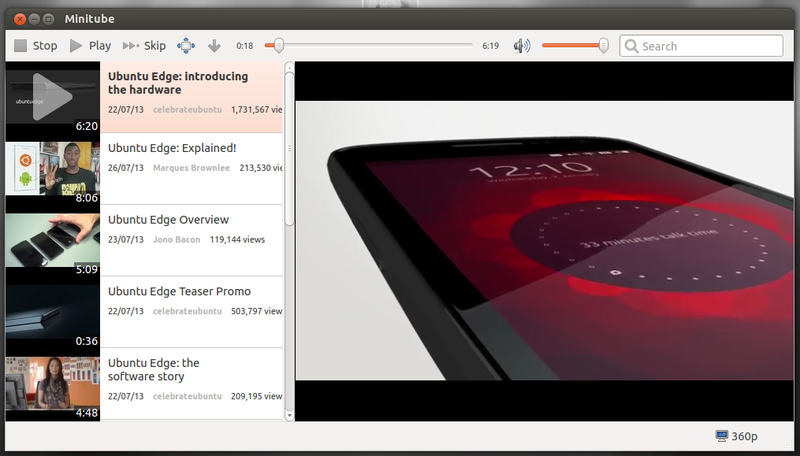 Minitube: When it comes to "conventional" YouTube video streaming and downloading in Ubuntu, nothing beats Minitube. You can type any keyword, and Minitube will give you an endless stream of videos to watch, as simple as that. Minitube does not use the Flash Player either, which means lesser CPU consumption. And of course you can download videos in the quality you choose with the click of a button. What more, Minitube is available for download in default Ubuntu repositories (Edit: Ubuntu 16.04 LTS supported). Click the link above. Youtube-dl: Command line tools are a big no-no to many. But I would argue otherwise. Youtube-dl is the best and easiest way to download YouTube videos in Ubuntu. It is fast and obviously nimble. And make no mistake, it has quite a wide range of functionalities. But if all you need is to download the best quality version of a particular video, open up the Terminal and type "youtube-dl<space><link to the video>". Does that look complicated? A more detailed installation and how-to-use instructions can be found in our previous post on Youtube-dl. Gmediafinder: A good Minitube alternative loaded with YouTube streaming and downloading capabilities. In my experience, Minitube has been more stable and a little bit more easier to use when compared Gmediafinder. But it gets the job done. To install it though, you have to add the following PPA and it is not readily available in Ubuntu Software Center (Ubuntu 12.04, Ubuntu 12.10 and Ubuntu 13.04 supported). Just do the following in Terminal. Movegrab: Yet another command-line tool for downloading YouTube videos in Ubuntu. Somehow, I am finding it difficult to download YouTube specific videos using Movgrab at the moment, even though I didn't had any problem with sites like Dailymotion. Many consider Movgrab to be a superior alternative to my favorite Youtube-dl. More details and how-to-use instructions on Movgrab at WebUpd8. Do the following in Terminal to install Movgrab. For Firefox: You need to download Greasemonkey extension for Firefox first. Afterwards, simply visit the script download page and install it. For Chrome/Chromium: Install Tampermonkey extension first. And then, like before, visit the script download page and hit Install button on top. Make no mistake, almost all the tools featured above (except the cross-browser script) does support other popular sites like Dailymotion, Vimeo, Metacafe, Liveleak, Blip.tv etc. apart from YouTube. Try them out and let us know your feedback. Thanks for reading.